Wow! They say time flies when you are having fun, and that couldn't be more true about our first month open! We are beyond thrilled by the response of our community and are so grateful to everyone who has walked through our doors to shop, chat, and learn something new! Announcing a simple concept at Frigg's: each week, we will feature a different lunch break project that you can do in less than an hour! These project days will rotate between Mondays, Wednesdays, and Fridays, with projects such as lip balms, candles, fermentation, lotions, and so on. We'll have the studio set up with everything for the designated project on the specific day, just pop by between 1130 and 130 and we'll guide you through the rest. We've (mostly) got our projects lined up for May. You can check out the calendar here! Most projects range in the $10-$15 range; all are beginner-level and, of course, tons of fun! We are delighted to partner with the fantastic Claudia Lucero from Urban Cheesecraft! Not only will we carry Urban Cheesecraft's DIY Cheese Kits (they are AWESOME!) and Claudia's book One Hour Cheese in the shop, but we are also working on a schedule for her to provide her stellar cheesemaking workshops in the Frigg's studio. Details coming soon regarding specific dates! We have been having a blast with kiddos in the Frigg's studio these past few weeks! Because of the success of our Spring Break Mini-Camps, we're planning to offer slightly extended versions throughout the summer! These are great options for parents who might not want a week-long camp (or don't want to pay for one!) but need a few hours here and there to get some work done or just stare at a wall without anyone talking to them. We'll be posting specific dates by the end of April. These Mini-Camps will be limited to six participants and will require sign-up 24 hours ahead of time, but will be essentially on a drop-in basis. We've been getting lots of requests for kids' birthday parties and are so excited to share the studio with Portland-area families! Our parties are an awesome way for school-age children to get some hands-on experience with our kid-friendly projects. We'll get our birthday party page underway here shortly, but in the meantime you can get a good idea of how it all works by visiting our general events info page. We're hosting a 4-hr gift-a-thon for Mother's Day on Saturday, May 12 in the Frigg's studio. This works two ways: 1) it's a fun outing for moms (or mother-daughter duos!) to enjoy as a pre-Mother's Day treat or 2) it's a fantastic opportunity to make a handmade - yet professional - gift for mom/yourself. 'll be whipping up bath bombs, sugar scrubs, and lotions, with the options for a few add-on items, if desired. We will also supply all the wrapping and supplies to make your gift extra special. More information is available here (payment link coming soon). $30 covers cited three projects and all supplies, pre-payment serves as RSVP and is highly recommended. One of our goals is to make homesteading adventures accessible to everyone. Making your own cheese can be a money-saving option, but the initial equipment requirements can sometimes be a hurdle. 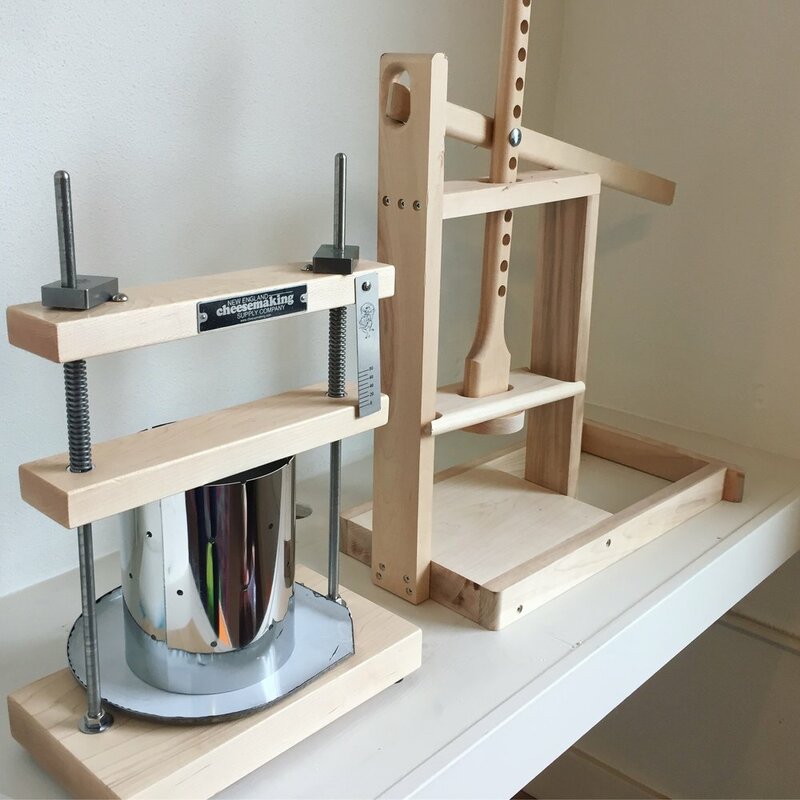 For beginning or advanced cheesemakers, investing in a cheese press can be a significant investment, and we're delighted to offer the economical option of simply renting the press. If you're just starting out, it's a great way to test the waters, and if you are an experienced cheesemaker, renting a press can save you money and kitchen space! All our rentable presses come with molds. If you fall in love with your press and want to get a new one, we'll take the price of the rental off your purchase! More details are available on our cheese press rentals page. Whatever brings you through our doors, we're delighted to meet you! As always, reach out with any questions you may have about these updates or anything else: hello@friggsmercantile.com or 503.974.7414.